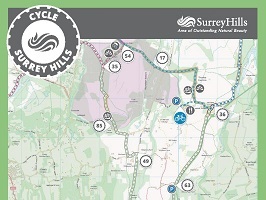 Mainly a nice route but odd to start by cycling along A29 on a family ride, it can be easily avoided. 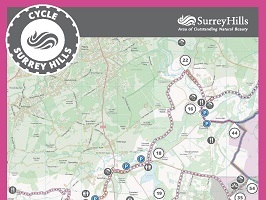 The Ockley TT course covers some main roads and country lanes and provides a great experience of rural surrey. 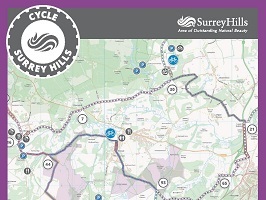 It is a relatively flat course with some great restaurants and pubs along the route. This would be perfect for an afternoon cycle with the family. Start from the Junction from Lake Road and Stane Street (A29). Heading south through Ockley. After just over two miles as the main road curves to the left, take a right turn along Okewood Hill. Continue along Okewood Hill and Honeywood Lane. At the following T-junction turn right along Horhsam Road. Follow this road as it becomes The Green. At the roundabout take the third exit (right turn) along Ockley Road. Follow this along as it becomes Lake Road and you will reach the junction where the route started. Available refreshments/Overnight stays: There are two pubs in Ockley where you can stop for lunch including the Kings Arms and the Parrott Inn in Forest Green. 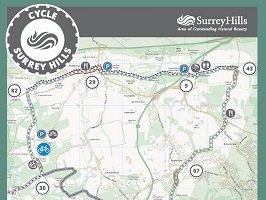 We recommend that you always carry a map when out cycling, even when following a published route. The most popular and detailed maps available are the OS Explorer series maps (1:25,000 scale/orange cover). They are available from many bookshops and newsagents. 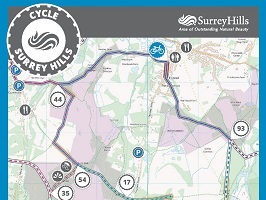 The relevant map for this cycle route is OS Explorer Map 146.